What did happen in Milwaukee between Aiden English and Lana? We can't answer that question but we do get into the finish of Big Brother, whether Raw or Smackdown Live is a better show. Deb Placey also stopped by to discuss her new job with NHL, the guys talk about the latest teaser trailers, Brian Gionta's retirement, a quick preview of ROH Death Before Dishonor & NJPW Fighting Spirit Unleashed, their issues with the NFL and Mark finishes the show with a public service announcement and story. Enjoy the show! What happens when Blake is left in the studio when his co hosts are busy? 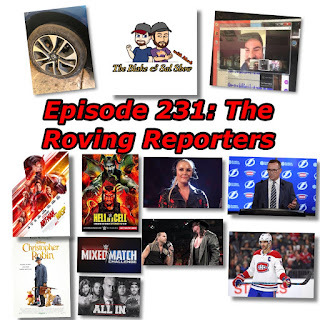 He brings in Kyle, to discuss the passing of Burt Renyolds, Henry Cavill being out as Superman, Less Moonves stepping down as CEO of CBS and review Ant-Man and the Wasp and Christopher Robin, Mike, to break down the latest NHL news and Scotty calls in a voicemail. Then finally Sal & Mark join the show to discuss All In, Renee Young on the Raw announce team, the NWA being relevant in 2018, whether or not we want to Shawn Michaels return to the ring, the Mixed Match Challenge and then finally preview match by match WWE Hell in A Cell. It's a crazy show, with some connections issues and people coming in and out, but it's still fun so sit back and enjoy.